Happy Tuesday! 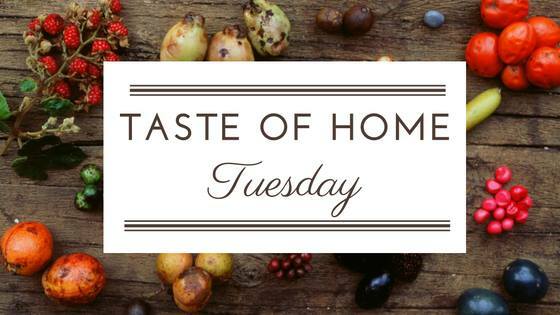 I'm once again participating in Taste of Home Tuesday, as hosted by Maureen from Red Cottage Chronicles. Take a moment to check out the links at the bottom of this post. 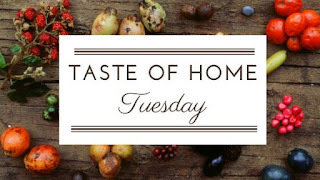 You will find several delicious recipes being made by some very talented cooks who also love all things Taste of Home. This is a chocolate themed week. A couple of these ladies are also participating in #choctoberfest. Check it out....I have been following along and there are some mouth-watering recipes being posted! About a month ago I picked up a copy of Taste of Home's 2016 Halloween Bookazine. I am such a sucker for these types of holiday magazines. The pictures are so perfect and everything looks so fun and festive. The trouble is, most times I just look in awe of it all and rarely actually take any of the projects on. That, however, is starting to change! My kids are the perfect age right now for some of this stuff! They flip through the magazines and ask (and I actually mean beg) me to try these things. This magazine is no exception. The list of spooky treats on my radar is out of control right now. 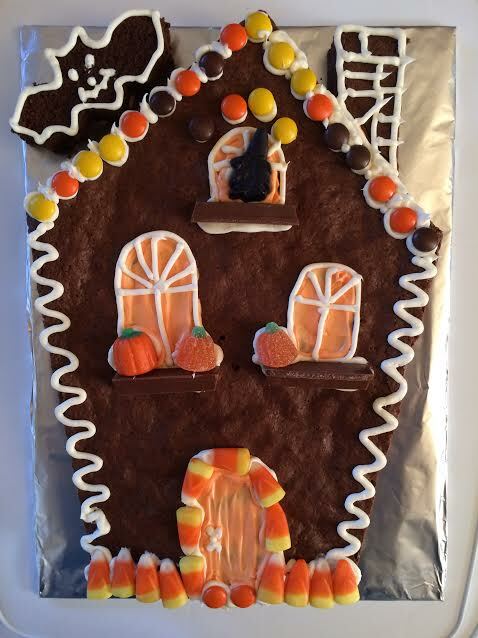 Here is our first project: The Spooky Brownie Haunted House! Here is a link to the original recipe. I have copied it, below, with my own comments in italics. -Preheat oven to 325°. Line a 13x9-in. baking pan with foil, letting ends extend up sides. I used parchment paper. It is one of my fave baking items. -In a large heavy saucepan, combine sugars, butter, water and, if desired, coffee granules (I used these, as I have found they really deepen the chocolate flavor in other recipes) ; bring to a boil, stirring constantly. Remove from heat; add chocolate chips and stir until melted. Cool slightly. -Whisk eggs until foamy, about 3 minutes. Add vanilla; gradually whisk in chocolate mixture. In another bowl, whisk flour, baking soda and salt; stir into chocolate mixture. -Pour into prepared pan. Bake on a lower oven rack until a toothpick inserted in center comes out with moist crumbs (do not overbake), 30-40 minutes. (Mine were perfect at the 35 minute mark). Cool in pan on a wire rack. -Lifting with foil (in my case, parchment), remove brownies from pan; let cool completely. Discard foil. 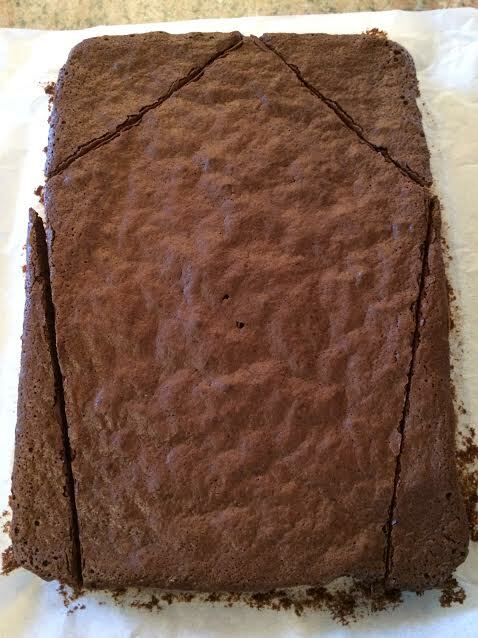 Cut off corners of brownie to resemble a house. Blank canvas, ready to go. These are the perfect texture to cut. If desired, cut scraps into pumpkins and ghosts using cookie cutters. (We made a bat!) Tint frosting as desired with paste food coloring. 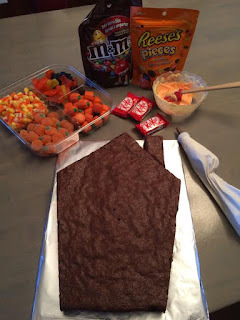 Decorate brownie house with frosting and candies. Yield: 16 servings. I must say, this brownie recipe may replace my tried and true. I can't believe it! They are exactly what I love in a brownie. Fudgy, dense, and chewy. They cook very evenly (I hate when the center is perfect but the edges are dry and crusty....what a waste!!) Since they were the perfect texture, they were so easy to work with. They carved very cleanly, and were heavy enough to easily transfer to a prepared board for decoration. Best of all, they taste SO CHOCOLATY! What a perfect dessert for a Halloween gathering! 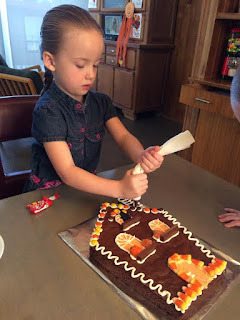 This would also be a perfect activity for kids to craft at a Halloween party. 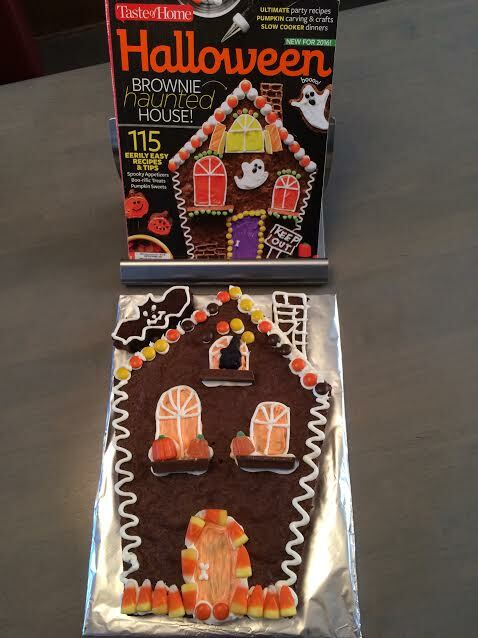 Just pre-make a few brownie houses and let the kids decorate in groups. This is so fun! While I don't go overboard at Halloween, I still like to bake a special treat for dessert that night!